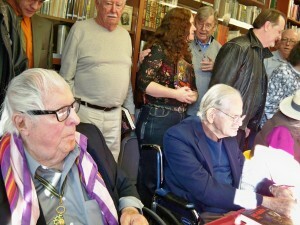 Seated: Ray Bradbury, Norman Corwin, George Clayton Johnson. Standing: Cody Goodfellow, John Tomerlin, Lisa Morton, Earl Hamner Jr., John Shirley, William J. Nolan. Photo by John King Tarpinian. Ray Bradbury and many other contributors to the The Bleeding Edge signed copies of the book at the Mystery and Imagination Bookstore in Glendale, CA on February 20. Stefan Rose posted two YouTube videos of the event. In the first Ray Bradbury arrives and greets Norman Corwin. The second scans the writers assembled around the autograph tables. This entry was posted in Like Show Business and tagged Earl Hamner Jr., George Clayton Johnson, John Shirley, Norman Corwin, Ray Bradbury, William F. Nolan by Mike Glyer. Bookmark the permalink.